Join the LA Phil and KUSC for a FREE celebration with hundreds of musicians, artists, dancers, family activities, and more! On September 30, the LA Phil will kick off its Centennial season with an epic festival showcasing L.A.’s creative spirit, with 1,800 musicians, artists, and dancers coming together to perform at the festival’s six hubs and along the eight-mile route itself. And that’s not all – the evening ends with a free concert at the Hollywood Bowl, where Gustavo Dudamel will lead the Los Angeles Philharmonic and welcome very special guests – including Katy Perry, Herbie Hancock, Kali Uchis, Youth Orchestra Los Angeles (YOLA), and more to the Bowl stage. To register for tickets, click here. 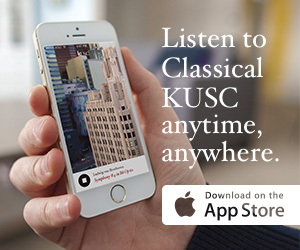 Listen to KUSC from 9am to 2pm as we broadcast live from the Hollywood Bowl! KUSC’s Alan Chapman, Brian Lauritzen, John Van Driel, and Gail Eichenthal will host. Be sure to check Facebook and Twitter as we report live from the festivities. Imagine the streets of L.A. without cars. Starting at 9am, you’ll be free to walk, run, skate, scoot, bike, and wander through the car-free streets, where six hubs will play home to performance stages, art installations, food trucks, screen printing, family-friendly activities, and more. Think of it as an eight-mile free space saved just for you! The hubs include Walt Disney Concert Hall (Grand Ave. between 1st St. and 3rd St.), Levitt Pavilion Los Angeles in MacArthur Park (Park View St. between Wilshire Blvd. and 6th St, inside the park), Koreatown (Liberty Park at Wilshire Blvd. between Serrano Ave. and Oxford Ave.), Melrose (Melrose Ave. at N. Windsor Blvd. ), Hollywood (Vine St. between Hollywood Blvd. and Yucca St.), and the Hollywood Bowl (Kagan Patio). Visit laphil.com/celebratela for more information including a list of performers, activities, transit information and for your chance to win free tickets to the Hollywood Bowl performance. The party doesn’t end when the street festival closes. A massive free concert featuring Gustavo Dudamel, the Los Angeles Philharmonic, and very special guests – including Katy Perry, Herbie Hancock, Kali Uchis, Youth Orchestra Los Angeles (YOLA), and more – will take over the Hollywood Bowl starting at 7pm. Please note that this is a ticketed event separate from the LA Phil 100 x CicLAvia festivities. The online sweepstakes is open now! RSVP above to receive updates and reminders.